If you're planning on going on more road trips across the country, you should really bring home the 2019 Forest River Grey Wolf 26RR! It's a reliable Travel Trailer Toy Hauler and it's available for a great price at Lakeshore RV Center! In fact, our wholesale costs ensure that you'll get the best price in the nation! You can visit our lot at 4500 E Apple Ave Muskegon Michigan 49442, or have us bring this RV to you anywhere in the country with our nationwide 24/7 delivery service! Give us a call today at 231-788-2040 and start your RV lifestyle tomorrow! 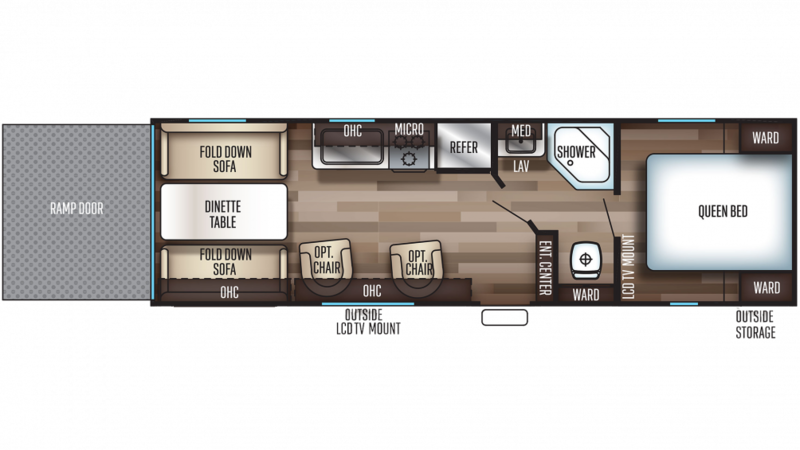 Expand the interior of this 30' 8" long, 8' 0" wide RV by sliding out the slides! With its height of 10' 6", you can have the freedom of walking around inside! Keep cool in the summer with the 13500 BTU a/c, or warm up in the winter with the 20000 BTU furnace. You'll enjoy relaxing, hot showers in the comfort of your Grey Wolf thanks to the 46 gallon fresh water tank and the 38 gallon gray water tank. There'll be plenty of hot water for dishes, too, with the LP tank capacity of 40 lbs. No need to trek to the communal campground bathroom because your Toy Hauler also has a 38 gallon black water tank and a convenient Foot Flush toilet! When you're looking to transport your favorite outdoor toys to the campground, just use the 16' 3" garage! With a cargo capacity of 2745 lbs, you can haul heavy luggage and toys easily!